La bandera cubana – ¡Viva Cuba! Before the national flag was officially hoisted in the Republic of Cuba, different flags from the major powers in the world flew in the Island: the flags of the Catholic Kings, the Spanish House of Bourbon, and Spain from the 16th to the 19th centuries during the colonial period; the flag of Great Britain from August 12, 1762 to July 6, 1763, during the British occupation of Havana; and the flag of the United States of America from January 1, 1899, during the U.S. intervention until May 20, 1902, day that marks the founding of the Cuban Republic. That day, The Lone Star Banner” was hoisted for the first time in the Morro Castle in Havana. However, this flag was not the only emblematic symbol that had existed in Cuba. Revolts and conspiracies against Spanish rule dominated Cuban political life throughout the remainder of the century and each of these conspiracies proposed their own flag. Narciso López, a Venezuelan military who had been field marshal of the Spanish Army, headed one of these movements in 1848 for annexation of the island to the United States. Although the plan was discovered and López fled to the United States, their movement had a flag that had been envisaged by the Venezuelan general. In New York, June 1849, in the home of the poet Miguel Teurbe Tolón, Narciso López asked Teurbe Tolón to make a sketch of that flag. After much discussion about the symbolism of its details, which was greatly influenced by Lopez’s Masonic affiliation, it was agreed that it would have three blue stripes representing the military departments in which Cuba had been divided since 1829—Western, Central and Eastern—and two white stripes to ensure their visibility from afar. He thought of a red square, as was customary in other banners, but eventually adopted the equilateral triangle, emblem of the union in freemasonry. It was also agreed that the triangle would have in the center a five-pointed star, emblem of association or fraternity, on a field of red blood. As requested by López, Miguel Teurbe Tolón made a drawing of the model of the future Cuban flag, and a year later, Emilia Teurbe Tolón, cousin and wife of Miguel, made the flag with white and blue silk ribbons and a piece of red cloth. This flag is honored today at the Museum of the City of Havana, former Palace of the Captains General. The birth of what was to become the Cuban national flag was sung by Miguel Teurbe Toulon in a sonnet whose first verse says: Majestic flag, sacred emblem / of glory and freedom; emblem and guide / of Cuba, which in the fields one day / will be greeted with songs of freedom. The flag made by Emilia became the model for the one sewn by a group of young women from New Orleans for Narciso López, who brought it on a military expedition to Cuba, landing in Cardenas, Matanzas Province. It was in this city, which was much later declared “Flag City,” where the banner first flew over Cuban soil on May 19, 1850. López brought the same flag in 1851 on a second expedition. Upon his landing in Playitas, Pinar del Río, he was taken prisoner by Spanish troops and publicly garroted in Havana in 1851. On October 10, 1868, the day that marks the beginning of the wars for independence in Cuba, Carlos Manuel de Céspedes’s flag, which was similar to that of Chile but with the colors inverted, was hoisted at La Demajagua, his plantation. The flag was made by Cambula, the foreman’s daughter, with fabrics she had at hand. However, Candelaria, daughter of Pedro Figueredo, one of the authors of the Cuban national anthem, was the flag bearer at the entrance of Bayamo, when the city was captured by the Spanish. The flag was blessed in the church by the Cuban priest Jerónimo Emiliano Izaguirre to the strains of the national anthem. Narciso López’s flag was adopted by the Constituent Assembly of Guáimaro, in April 1869. The Lone Star banner was reproduced on the battlefields during the Ten Years’ War (1868-1879), the Little War (1879) and the War of Independence (1895-1898) and accompanied supporters of independence who lived in exile. Many Cuban women wore the colors of the flag in defiance of the colonial authorities. The Cuban flag is rectangular with five alternately arranged horizontal stripes of equal width, three turquoise blue and two white, and a red triangle with a five-pointed white star in the middle. 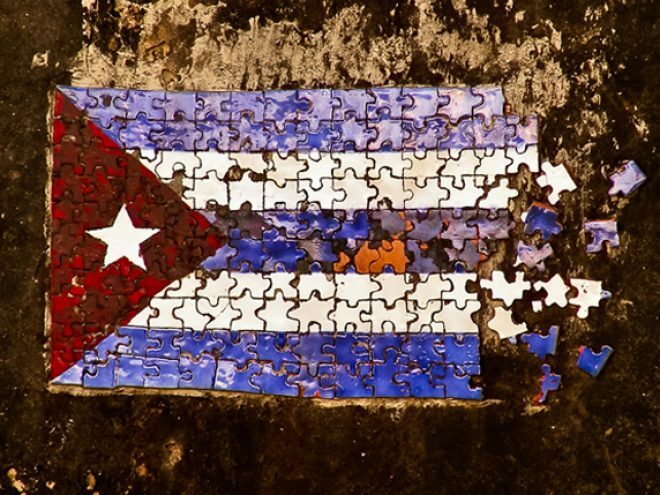 Freed of any freemasonic connotations, the star represents the free, independent and sovereign republic of Cuba and Cuban unity; the red triangle stands for equality, fraternity and freedom, and the blood shed in the struggle for independence. The white stripes depict the ideals of purity and virtue of the Cuban people, while the blue stripes represent the three departments in which the country was then divided—Western, Central and Eastern. The Cuban flag, which has been the source of inspiration for poets, photographers, artists, in general, continues to have great symbolism in the Island and occupies a prominent place in the people’s patriotic feelings nurtured from an early age. This is why in Cuba no flags are burnt, denigrated or dishonored for it represents the unique qualities of a people, and is a revered emblem by its children wherever they may be.